What Causes And Cures Warts? 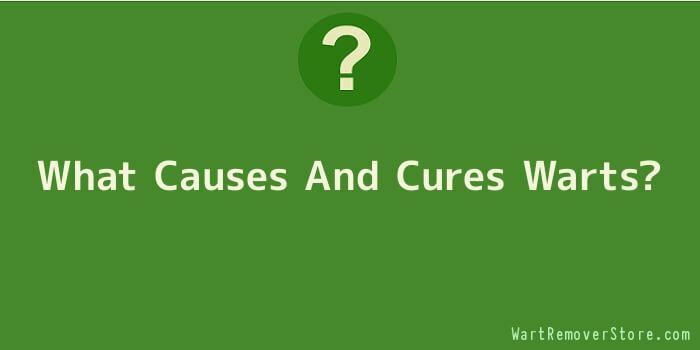 The short answer is that the cause of warts is a virus. The longer answer is that there are several different types of warts and over a dozen different viruses that can result in warts. As such the appearance of warts differs as well. Over the centuries the cause of warts has been shrouded in superstition. People used to believe that they were caused by witchcraft, curses or “bad karma”. Get rid of warts in the privacy of your own home. However, modern medicine has shown what causes warts to be due to a variety of viruses that infect the skin. Modern medicine also provides several different treatment options for how to remove a wart including natural wart remover home remedies. Usually, they are manifestations of the human papillomavirus (HPV). Some people think that HPV only causes genital warts, but this not true. For example, plantar warts occur on the soles of the feet. Plantar warts are very common and can be painful because the weight of the whole body is pressing down onto the foot. There are home remedies for warts as well as medical treatment options including wart freeze procedures for plantar wart removal and other types of warts. Most commonly they show up as warts on fingers. However, the virus can also cause the appearance of warts on hands, warts on feet, face, and mouth. There are over 100 different varieties or strains of the human papillomavirus. Different types of warts are caused by different types of HPV. This is part of the reason why treatment can be difficult and confusing. As warts as viral, anything that weakens our immune system is a secondary cause of warts. This means that a wide range of conditions, from cancer to organ transplants, to AIDS, can end up resulting in warts because our weakened immune system makes it easier for skin viruses to take hold. This also explains why kids are more likely to get warts. Typically, children have weaker immune systems and so are more vulnerable to a virus. In fact, on average 1 in 10 children or young adults will develop warts. So if you have problems with warts, you are certainly not alone. The bad news is that warts usually continue to increase in size and distribution and may become more resistant to treatment over time. As HPV is a contagious virus, causes of warts can be skin contact with someone else who already has HPV, or using a towel or other personal item from a person who already has warts.